Children in class after eating their school meal at École Nationale République de la Colombie in Port-au-Prince. It’s been over two years since the earthquake struck Haiti. Now, with a massive hunger crisis unfolding on multiple fronts in Africa, the Middle East and Asia, the spotlight has shifted away from this country with tremendous reconstruction needs. Developing a national school feeding program is a top priority, but the danger is funding may drop off, thus breaking the momentum toward achieving this goal. 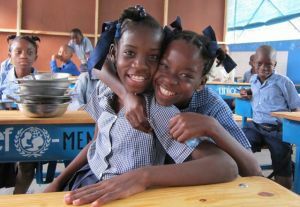 A grant from the U.S. McGovern-Dole school meals program has been significant in helping Haiti. But additional funding is needed to ensure every child in Haiti receives school meals and an education. With drought conditions hitting parts of Haiti, school feeding takes on more urgency. Families who struggle to access or afford food need the safety net of school feeding. The United Nations World Food Programme (WFP) is helping Haiti provide school meals. Elizabeth Jennings, a public information officer for Haiti, provides us an update in the following interview. How many children are currently receiving the school meals from WFP? 1.1 million primary age school children. Are areas harmed by drought included in WFP’s school feeding? WFP’s school feeding programme in Haiti is currently countrywide, supporting over 3000 schools. So, yes, we reach areas that have been and may potentially be again harmed by drought (where you often see chronic food insecurity), as well as areas that were directly and indirectly affected by the earthquake and areas that have been affected by flooding, among others. We are also in the process of re-targeting all of our activities after the emergency response, including school feeding, and are focusing on the most food-insecure areas in the country, which would also correspond to areas that are vulnerable to droughts, such as the Nord-Ouest. How has funding from the McGovern-Dole school meals program helped WFP and Haiti? The 3-year grant of $24 million dollars from McGovern-Dole has been vital to the program. The donation is made in in-kind commodities of WFP’s standard school meal ration (rice, beans, oil, salt), and has provided reliable, consistent support, starting in 2011 (the first year we received the commodities), and will provide commodities through the 2013-2014 school year (the last year of this grant). We just received the second tranche of commodities which are currently the only resources we have to begin the program at the start of the 2012-2013 school year in September 2012, under the School Feeding Development Project. There is also a small annual allocation, as part of the grant, for capacity building to the government of Haiti’s national school meals program, which is a critical priority for our work in Haiti. It is also one of WFP’s global strategic objectives. Monitoring & Evaluation, which will be a crucial part of the development of a nationally owned and managed school feeding program, also falls under this objective, alongside building local procurement capacity, with school feeding as a platform to improve local production and increase food security. What are the biggest challenges currently facing WFP in providing school meals and helping Haiti build a national meals program? Is funding an issue? Yes, funding is an issue. As is developing consistent, long-term funding so that the national program is able to maintain momentum for growth. Fragile national capacity and weak implementation capacity is also, as you suspect, an issue. There is a vision for a universal, free school meals program by 2030. Attaining that goal means significant efforts in developing a strong legal and policy framework, strong leadership within the PNCS, support from the Ministry of Education, wherein PNCS resides, and a consistent source of funding for the program that supports the achievement of longer-term goals. WFP provides both technical and implementation support for the school feeding program, as well as prioritizing growing its local procurement activities in the country, linked closely with the school feeding program (as mentioned in point 3). There are also other school feeding partners and donors in Haiti and though WFP has the largest program, these other parallel school feeding programs (and pipelines) can occasionally make coordination among actors somewhat tenuous, though not impossible. Are children to receive summer feeding when schools are closed? WFP is unfortunately not able to provide food for summer camps (camps d’été) this year due to limited funding and resources, though traditionally we have incorporated summer camps into our overall school feeding program. For more information about Haiti visit the World Food Programme. Article first published as Haiti: Drought, Low Funding Threaten School Meals Program on Blogcritics.